Total Score: 8.25 + EDITORS CHOICE! Introduction: Phenix has reinvented itself as a company and their new rods boast new materials and styling that effectively modernize the brand. 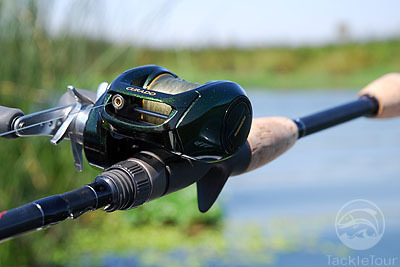 Our first official review from this manufacturer is the X10, which is also the first entry into our Crankbait Rod Wars. 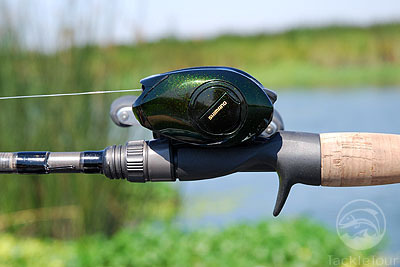 We take a look at this �hybrid� crankbait stick to see just what Phenix brings to the table. Length from Back of Reel Seat to Base 9.5"
Impressions: So what makes a rod a good crankbait stick? 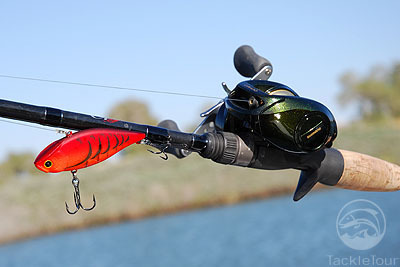 A good crankbait rod needs to be relatively soft and feature a moderate flex action so that when fish hit fast running lures the bait will not rip out of the fish�s mouth before it is solidly hooked. This soft forgiving action also must be forgiving enough so that when fish dive and surge the smaller treble hooks will not rip free. It is because of these attributes that for years fiberglass was the preeminent choice for this application. The only problem was that these rods would often feel sloppy as they lacked sensitivity and also weighed significantly more than graphite. With new advances in materials and clever hybrid designs crankbaits rods are now becoming lighter, better casting, and even more forgiving. 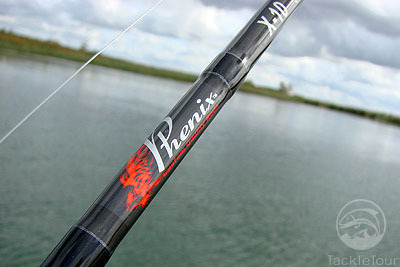 The Phenix X10 is a great example of hybrid design and is constructed out of a combination of high modulus graphite with a fiberglass tip. 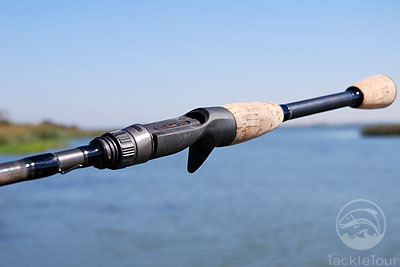 The rod makes use of Toray materials in its construction and the reel seat and guides are all courtesy of Fuji. With a line rating of 8-20 one would expect that this rod can handle a wide range of baits, and to further the point the rod has a lure rating of � all the way to 1oz.. Overall the rod has a nice understated look and feel, not a lot of bling here, just a straightforward rod designed for a singular application. When I first held the rod I couldn�t even tell there was any glass in the stick, in fact it felt as light and balanced as some graphite rods. Even when whipping the rod around in the air the X10 feels very crisp, it was only after pressing downwards on the tip where that unmistakable forgiving glass-like curve revealed itself. Lab Tests: Before hitting the water we put the rod to the test in our lab. Testing crankbait rods in the lab is quite unlike traditional rods as the soft tip makes it look like we are overstressing every single rod in our tests. Though we grimaced while looking at the rods curled over in the lab these rods are designed soft with purpose. When the Phenix X-10 was put on the RoD WRACK we took note of the rod's deflection characteristics in comparison to other similarly powered sticks, this list of rods include previously reviewed sticks as well as other members of our 2009 Crankbait Rod Wars. Rate of Deflection (RoD): What we found is the X-10, despite it's rather generous lure rating, is more of a medium powered cranker falling inline with rods such as the G.Loomis CBR783 and Megabass Hien Type-S. Several other rods in our Crankbait Rod Wars fall into this same power range so we have the beginnings of our lightweight division with this first review. Fig. 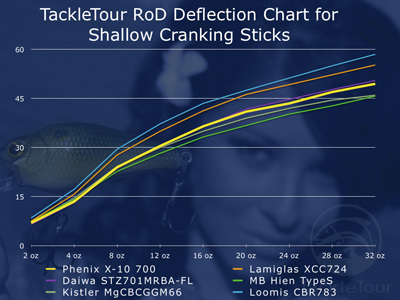 1 : This RoD Deflection Chart shows the deflection characteristics of our Phenix X-10 versus several similar sticks. Other Stats: In our "Other Stats" department, we note that the X-10 comes in at a very respectable weight at just over four ounces. The rod's balancing torque of .190 ft lbs seems right in line with two of the other three rods for which we have this statistic and in hand, the X-10 when compared to the Falcon CCB-5-174DR we are also testing in the CB Rod Wars is definitely more forgiving in action but in terms of balance the Falcon rod does seem easier to balance out with a wider range of reels.